Meaning “to colour”, Coloratura is the name of Cartier’s newest high jewellery collection. And as the name goes, the Maison wants to celebrate colours and cultures. The Cartier Coloratura collection is inspired by the diversity of our world — from the vibrancy of India and staccato shades of Africa, to the subtle palettes of Japan and overall contrasts of Asia. The French jeweller officially launched its high jewellery collection at the Louvre in Paris, simultaneously bringing a close to the Paris Haute Couture Fashion Week with a most scintillating summer evening of high fashion and haute joaillerie. 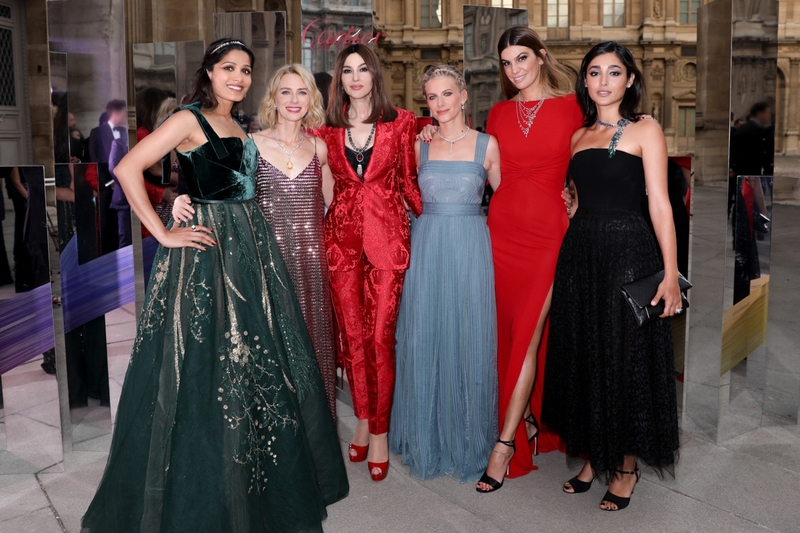 The dinner and presentation of the stunning Coloratura pieces was graced by a number of international female celebrities, including English actress Naomi Watts, Iranian actress and singer Golshifteh Fahrani, Italian actress Monica Bellucci, French actress and director Mélanie Laurent, Indian actress Freida Pinto and Franco-Italian socialite Bianca Brandolini. These mega stars wore vibrant colours in the palette of the new Cartier Coloratura collection: Ruby reds (Bellucci and Brandolini), as seen on the Holika ring — centred by a 15.05-ct cushion-shaped rubellite; emerald greens (Pinto), found on the Chromaphonia earrings with two fancy-shaped emeralds from Afghanistan totalling 10.87 cts; and shimmery pinks (Watts), highlighted in the spectacular, almost tribal, diamond-and-pink-spinel Kanaga necklace. Brought together in the prestige setting of the Cour Carrée in the Louvre, a glass structure was specially constructed for the occasion. This transparent showcase became centrestage for a concert of classical and contemporary music, where dancers adorned the creations from the Cartier Coloratura collection as they performed a choreography created by Marie-Agnès Gillot, prima ballerina at the Paris Opera, who was also present at the event. The gala dinner ended with a live performance by singer Dua Lipa. Click on the images below to view the six leading ladies dripping in Cartier high jewellery pieces at the exceptional event held to celebrate Coloratura.